Lately my brain has seemed like the photo above — a jumbled mess! It’s full of little thoughts and ideas that I’m sure could be turned into something beautiful that would bring a glow of light to life if I could just sort them out. 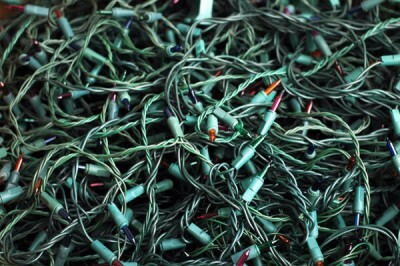 The thing about trying to untangle Christmas lights (or even just a pile of string) is that it’s easiest if you can find one of the ends. Having one bit that is a starting place in the process is a key to success. If you can find that bit, even though it’s still a lot of work, you’ve got some hope of sorting out the mess. The problem with my mental Christmas lights at the moment is that it all seems interconnected. I can’t find a starting point from which to begin unraveling all of the thoughts. Thankfully, the thoughts are good ones – my mind is not weighed down with troubles, but it’s still a mess. I need to journal. I know that if I could just put words to everything going on in my head – the promises of God, the breakthroughs that I feel are just around the corner, the doors God is opening, the hope I feel for the rest of this year, the excitement for my birthday, and so much more – I would have things sorted out in no time and the light would shine beautifully. That’s just how my mind works, words are required (either aloud or in writing) to know what’s going on in there. If only I could find a starting place. Every time I go to write, every subject I want to talk through with God leads back into another, a different and maybe more appropriate starting point. Unfortunately, that one then leads to another and another and even another until I find myself back at the first subject and still staring at a blank page. So, now what? I began this blog post in hopes that I might find the starting point from which I could move forward in my journal. I’m not sure I found an answer, but perhaps I’ll find something more important – that I am not alone in this jumbled mess. I’m hoping that by sharing my own ball of mental Christmas lights, maybe others will realize that they are in good company. Sometimes it takes time to sort out all that goes on inside our heads and hearts, and that doesn’t mean the process is bad (or that the mess is bad either). It can be frustrating when you just want to see the finished product of a beautifully decorated tree or home and move on to the celebrations, but what if we could celebrate the process? What if we found others who could help us sort out the mess and then stick around to celebrate the beauty with us? Who might be right there beside us in the process, ready to help if only we let them? It might take a while to sort out all that God is doing in me. I might just have to jump into the middle of the mess and choose to start somewhere. Eventually, I’ll find an end and be able to plug the lights in and see the glow, maybe even before it’s all straightened out. I have a feeling though, that as I work on sorting out my thoughts, God will bring people along to help me sort and then celebrate the finished product. I pray He’ll do the same for anyone else out there that needs to sort some stuff.